The highest hill on Fanad N of Knockalla. The name of the hill appears to be connected with the townland of An Mhoirinn/Murren in Clondavaddog parish. The initial B- of the genitive may seem anomolous, given that the nominative has M-, but these are the forms which have been collected locally. OWEN: You know that old limekiln beyond Con Connie Tim's pub, the place we call the Murren? – do you know why it's called the Murren? (MANUS does not answer.) I've only just discovered. It's a corruption of Saint Muranus. It seems Saint Muranus had a monastery somewhere about there at the beginning of the seventh century. And over the years the name became shortened to the Murren. Very unattractive name, isn't it? I think we should go back to the original – Saint Muranus. What do you think? The original's Saint Muranus. Don't you think we should go back to that? (No response. OWEN begins writing the name into the Name-Book.) 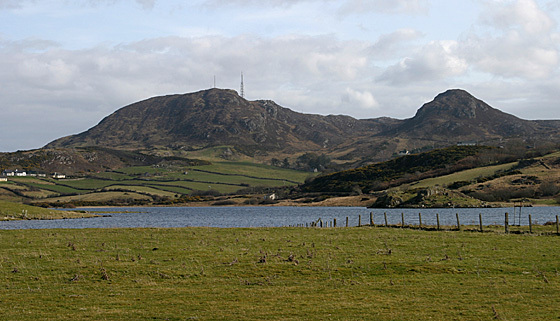 (Brian Friel, Translations, Faber & Faber, 1981) Cnoc na Boirne is the 1338th highest place in Ireland.